These beautiful flowers and butterflies really do look wonderful. 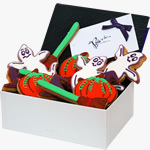 They taste delicious too, perfect for birthdays or just to say thanks! 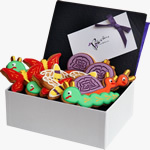 Moving into a new home is wonderfully exciting..sending these stunning biscuits as a welcome gift will provide the finishing touch. Shoes, boots and handbags. Every glamour girls dream combination made from delicious hand iced biscuits. Mwaah!! 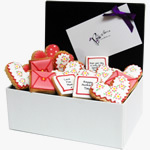 Send best wishes to the happy couple with these delicious gift biscuits. These can be customised to match the wedding colours. Kids love bugs don't they! 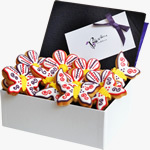 Beautiful gift biscuits for the little ones. 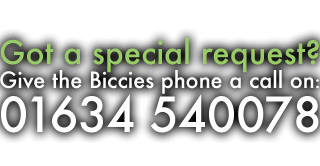 Including butterflies, snails, caterpillars and bees. Simply delicious bush tucker!! 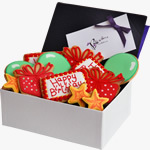 Say Happy Birthday with a biccies box...12 delicious hand iced biscuits, stars, balloons, presents and 3 personalised biscuits. A delicious celebration. 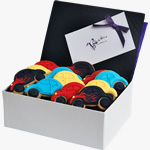 A box of 12 yummy biscuits for the car enthusiast. These supercars will force a supersmile...catch them if you can, they'll be gone in 60 seconds! 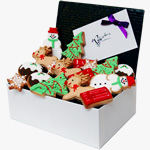 Christmas Box A scrumptious edible Christmas gift biscuit box including a mixture of snowmen, candy canes, Santa's stockings, mince pies and Christmas trees..
12 beautiful hand iced gift biscuit baubles delivered by post. 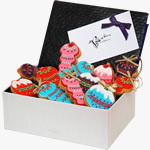 These look fantastic hung upon a Christmas tree...watch them go missing one by one..
Our luxury Festive box is bound to delight...who wouldn't want to recieve a box of these stunning biscuit gifts. Contains 18 biscuits. 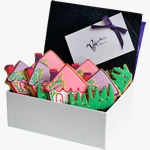 Instead of chocolates, give yummy hand iced biscuit gifts this Easter. Containing lambs, chicks, eggs and bunnies. Give your Father a Biccies breakfast...egg, bacon, tomatoes and beans made from delicious iced biscuits. Thanks Dad! straight from your heart! 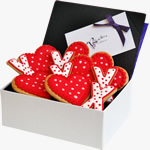 Stunning hand iced biscuit gifts, tell the one you love just how much with this letters and hearts box. 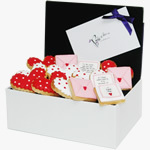 ThanksMum Tell that special woman just how much you love her with biccies letters and hearts edible gift box. Mum's of all ages will love these.